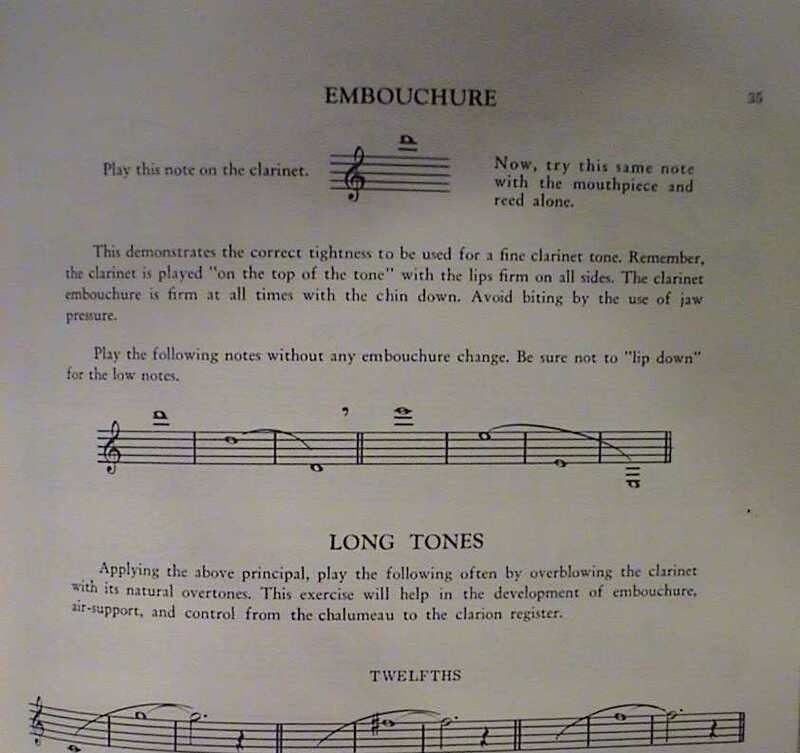 How does one teach the appropriate Clarinet embouchure ? professional player (thanks to my Band Director for getting me free lessons). staccatos, high notes and low notes all with appropriate ease. Yes, your right hand thumb is an important part to your embouchure. critical in assisting yourself in a good embouchure. quick instrument changes and even quick clarinet changes. So let’s move on to more of the embouchure itself. A good air stream supported by your diaphragm. teeth ? use your right thumb for that. larger lips and I roll my lip completely over my teeth. But a ?proper? helps in your lower lip and helps control the reed. push the clarinet up to your upper teeth. as it possibly could without one. your mouth) and find out for yourself if it helps your tone. The tongue position should be fairly high and back in your oral cavity. back until the sides of your tongue touch both the insides of your back teeth. Notice how the sound of the air coming out of your mouth changes. R-13 players) but enough tonal projection to carry in a large auditorium. Not all mouthpieces are created equal. the reed vibrates), material, tip and side rail thickness .. you name it. determine where you lower lip should go. we should always play the mouthpiece with the correct embouchure location. The lower lip allows control over the reed and allows up to shape the tone. course, reeds vary in cut too so reeds do have an impact. should be able to play just your mouthpiece and get an altissimo D.
One area that is talked about is the use of Cold Air versus Hot Air. Some consider this a bunch of “Hot Air” but the description has some merit. fingers are touching your nose and you can blow into the palm of your hand. There are two method to bring the lip up to the reed. embouchure, and it places the lip in the wrong position on the reed/mouthpiece. compensate. But this solution does not assist in the throat area. help in all areas of your embouchure and tone support. frequency when you use a soft reed. joined together) shows the spectrum for a soft reed. the hard reed makes it easier to play high notes.